Nowadays, everyone is talking about cryptocurrencies. Afterall, the world is becoming digitized in every aspect then why should crypto sector lag behind? Cryptocurrency is changing everyone’s life in some or other aspects. Even if you don’t want it to it will affect your life directly or indirectly. With the lapse of time, Bitcoin ( the world’s first digital currency with a blockchain technology ) and Ethereum are playing the major role in the majority of the crypto enthusiasts. If you are reading this, then I am pretty sure you must have come across the above facts. Right? Well, you must, because new millionaire and billionaires are being made through cryptocurrencies. By now, most of the countries are following the crypto trend. But you know, Every coin has two sides. It has two possibilities. You have to make the situation in your favor and make them the most positive outcome of it. The competition is so intense between the crypto coins that they are trying to come up with the unique idea that could be performed on a blockchain technology. Developers are constantly looking for the way to advance up their vision to come with the best use of decentralized network so that they can come under the radar of being noticed by multi-billionaire crypto companies. The race to become the best among many is never-ending. We have so much to choose from that analyzing every suitable coin from every dimension takes our considerable amount of time. Which currency should we invest in? Which currency suits your requirements? Which currency will give the better returns? Where do we store such coins? Which currency provides the best feature according to your requirements? So much to choose from. Which one is suitable? Right? Don’t worry because as like every time we here, at coinscage has come with another cryptocurrency for your convenience. We will provide you a detailed review on existing cryptocurrencies for you to fully analyze whether you really want to invest it or not? We help you with your process of decision making. 1.2 What is Ethereum Classic? 1.3 How to buy ETC tokens? Why there are two Ethereums? Which one is the original one? Which one has the great future? and so on. So let make us clear the confusion between both of them. But before we move ahead let us start with Enthereum (ETH). Ethereum is an open-source, decentralized and blockchain based digital currency proposed by Vitalik Buterin, a programmer in late 2013. It also features smart contract (script) functionality. It aims to eradicate the drawbacks of Bitcoins. If you are the beginner in a crypto world then, to know every detail about Ethereum (ETH). And now before we move further let us see the history which leads to the beginning of Ethreum Classic ( ETC ). By this, you must know that Ethereum was first to release. Then the famous DAO attack took place. The entire outlook and internal system of Ethereum work on the basis of smart contracts. The DAO which was going to transform Ethereum for eternity was a complex smart contract. Basically, The DAO was going to decentralized venture capital fund. The potential and reputation what DAO holds were enough to make the race among people to get their share of the pie from DAO. The DAO was a digital organization that aims to provide the decentralized business model for both commercials as well as the non-profit organization. The main idea behind the project DAO was to eradicate the organization with no structure for Board of Directors or employees but to have investors that will work as key factors. Later, DAO was crowdfunded by sale tokens in June 2016 in which they set the record for raising the second largest amount of fund in history. Then a massive exploitation took place after the event of crowd-funding. Users took advantage of DAO code to drain the accumulated fund of $50 million into a subsidiary account. It was later, taken out of the list from the major exchanges in late 2016. The exploitation led to the debate between the members of DAO and community of Enthereum (ETH) for which action should be taken to solve the issue. Ultimately, a decision to take a vote in June 2016 was accepted. No action: The integral component of many of the blockchain immutable had “code is a law” that supported Enthereum. These group of the people was stuck around for ETC. Soft Fork: It provides the option to the holder to either get updated or not. The decision was in the policy with that updated and non-updated holder should still continue to interact. The main idea the behind the Soft Fork is to isolate all the existing blocks that contained the transaction of hackers which will stop them to move the stolen ether to the other address. Hard Fork: The main difference between the Hard Fork and Soft Fork was that Hard fork didn’t provide the option whether to upgraded and non-upgraded holder to interact. It simply stated that non-upgraded holder will not be allowed to be a part of the new ecosystem. After the vote, it was decided to apply a hard fork in the Ethereum Code and to transfer the exploited ether into a new smart contract so that it can be restored back to the owners from which it has been drained out. Ethereum Classic came into existence when some of the community members of Ethereum denied the proposal of hard forks on the basis of “immutability”, the principle that the coding of blockchain would not be changed and they keep performing their operations using the unforked system of Ethereum. Ultimately, Ethereum Classic was born. Now after we know about the Ethereum Classic let us see what actually it is? The Ethereum platform has two classifications Ethereum (ETH) and Ethereum Classic (ETC). After, the decision making the new tokens named to Ethereum and the old tokens were renamed to Ethereum Classic. Ethereum Classic is a digital currency based on blockchain technology, an open-source public platform that features smart contracts. It is much similar to Ethereum that supports solidity language. It is programmed without any possibility of downtime, interference, and third-party fraud. In conclusion, we can say that ETH is same as ETC. 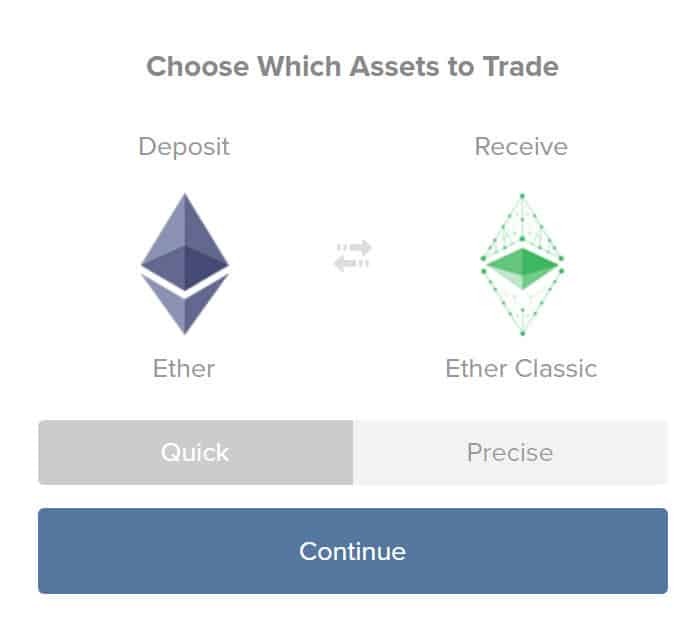 Now after you know the status and beginning of the Ethereum classic which is a classification of Ethereum platform, let us move ahead with the methods you can buy your ETC tokens. How to buy ETC tokens? One of the most convenient and easy methods to buy your ETC tokens is via Changelly. Because buying ETC tokens directly with fiat currency is quite difficult. I personally prefer changelly to buy any tokens as to get the best exchange rate. ETH/BTC/Altcoins to exchange it for ETC tokens. Your ETC wallet address where you want to receive your ETC tokens. To buy your tokens via Changelly, you must follow our changelly guide now. Another to way to buy your ETC tokens is via Shapeshift. ShapeShift is also a currency exchange platform like Changelly. It currently supports 33 digital coins for exchange that also include Ethereum Classic (ETC). Your ETC wallet address where you want to receive your tokens. To acquire your ETC via ShapeShift now, follow our guide to convert one crypto to another. Now after you have acquired your ETC tokens you need to have some wallet to store it. The Ledger Nano is one of the most popular Hardware wallets which allows you to store ETC. It also provides support to ETH, BTC, XRP and many more cryptocurrencies. Since you own the private keys to your crypto address, your funds are extremely safe from any hack or theft. You can go through our complete Ledger Nano S review to know more. Jaxx is a mobile wallet that is gaining its popularity and is being used by a large number of crypto enthusiasts. It is a very convenient wallet that supports numbers of currencies including ETC. Jaxx is a recommendable wallet for those who are looking for storing their tokens for a short period of time. To get a detailed information on Jaxx, click here. Classic ether wallets support future of ICO tokens. Users can get access to this wallet via a web browser. It is safe and secure and has all the features that support Ethereum Classic. It is one of the most promising platforms among the users of Ethreum Classic. It will provide a back support Ethereum Classic ecosystem to grow as a whole, which is great news for ETC HODLers. To get a detailed information on Ethereum Classic, click here. After you know about the wallets where you can store your ETC tokens. Let’s see what are the pros and cons of Ethereum and Ethereum Classic. It has recently got support from few big players in the market. It holds with the immutability philosophy of the blockchain. It doesn’t provide access to the up-gradation made in ETH. It is considered to be an attacker on Enthereum community. It is booming at a very fast pace. It holds a good market image. It has protected themselves from all types of issues and given back the stolen money to DAO owners. It has a backup support of big multi-billionaire companies. It operates against the immutability policy. At the time of writing this, dated 20 November 2017 Ethereum Classic has a total market cap of $1,820,754,611 with a total supply of 97,620,265 ETC tokens. It has secured its position on rank 11 in coinmarketcap. The majority of the crowd has been in the favor of Ethereum while it has its cons. The crypto market in terms of ETC is unpredictable. It depends on how you are going to analyze it. While it can be said that it follows the immutability which Ethereum (ETH) is against for. ETC has grown with a considerable amount of return to investors and has been ranked in top 11 cryptocoins in the market. ETC needs to upgrade itself to be in the competition to ETH and secure its position in the crypto market. While future of the crypto market is very dynamic. It keeps on changing from the current situation and position. Investing in ETC is completely going to be your decision as ultimately, you will be a risk bearer. We are unsure about the future of ETC because the main leaders are on the side of ETH and ETH has maintained its position on rank 2 for a very long time. ETH holds a great future for growing and becoming more powerful in few coming years. We cannot say this for Ethereum Classic as it has always been a black sheep of Ethereum community. ETC is also known to be full of scammers which are reducing the people faiths in it. It has reduced its value, ultimately. It also has an unfortunate history of DAO. It has left the life longing impact on the future of Enthereum Classic. Also, the core flaws of ETC has given rise to the more stronger platform of ETH. Enthereum Classic seems to be slowly sinking in the market of cryptocurrency. In conclusion, we can say that crypto has a feature of “free choice”. So choose wisely. So, what do you think about Ethereum Classic? Is Ethreum Classic is worth to invest for? Give us your opinion on a comment section down below. Till then, keep exploring the reviews on other digital coins on Coinscage.